I revisited my journey through the Yucatan for my choice (though it’s a spooky one). More on Mayan Journeys. 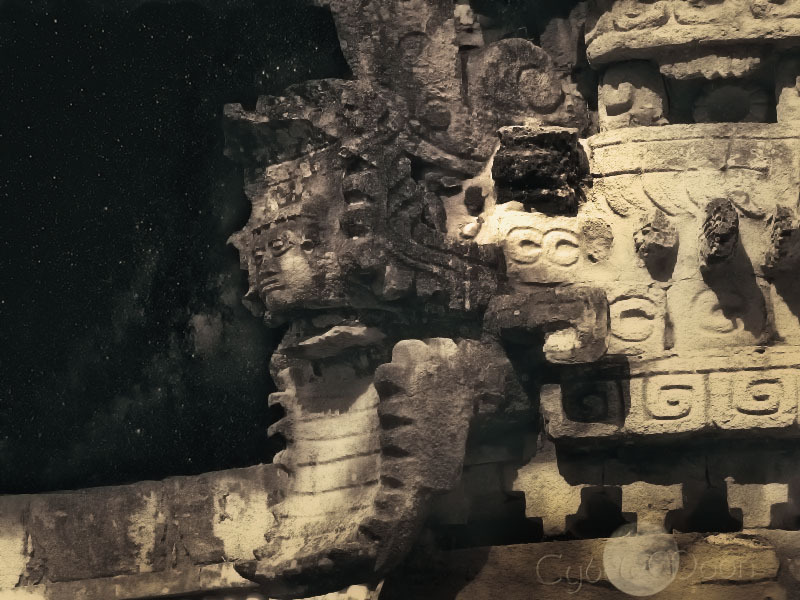 I have an interest in the civilizations of the pre columbian New World, and especially the Mayan, which I have written about in an earlier post(Star Child Musings) and in my travel journal (In the Jaws of Kukulkan). Their art and architecture were astonishing, along with their mathematics and calendar. They were governed by kings and powerful astronomer/priests ( like in the Vatican observatory!) who interpreted cosmic events and seasons into sacred ritual. Both terrifying and beautiful, their mythology begins in deep caves, the underworld known as Xibalba (place of fear) where the dark gods live. There, the tree of life takes root and eventually reaches the heavens. In some accounts Xibalba is also said to be found in the dark rift of the milky way. The tree of life is a journey of souls. Their mysterious culture of which we know only a little, and their mythology captured my imagination. They had written codices – which sadly were burned and destroyed by the Spanish monks. Mayans did embrace Christianity, partly because they could relate to a god who was willing to die in a blood sacrifice. A small piece of their poetic writing did survive as a sacred text called the Popol Vu and their glyphs have only recently been deciphered. In spite of the desperate darkness of the bloody sacrifices that marked the post classic period I found and find their story very compelling. I didn’t have a great camera at that time but I think I was able to capture some of the magnificence and mystery anyway. Besides the well known Chichen Itza and Tulum, the ruins of their many cities are hidden in jungles all through the Yucutan and Guatemala. I traveled on the old Mayan road called the sac be and on the ruta puuc. The god Chac filled the skies with ominous clouds, jungle rain and finally appeased, allowed hot sun to pour down. I think monochrome is very effective for these. I hope you think so too. PS: For all who wonder, I did climb the pyramid- damn near killed me! and in Mayan my name is “Monkey Cloud” along with all their wonderful names of Star Jaguar, Smoke Mirror and 19 Rabbit!! The god Kukulkan, was the feathered serpent. It absolutely is !! Thanks Leman!! Fascinating, stunning! The lightening is incredible, Cybele! thanks Amy, the place was incredible!! Effective indeed. I too am fascinated by ancient civilizations. They have a sense of mystery, intelligence, and wealth. Thinking of the lives those ruins once protected and embellished that now are no more. Great posts, dear Cybele. Loved. Thanks for posting them. You have a wonderful weekend. Sometimes I wonder whether all these that we have built and cherished will someday become ruins as well, for archeologists to dig and study our remains and conjecture concerning our lifestyle, and be filled with wonder and mystery. “What happened to them?” they will ask. But we’ll be no more. I wonder. Peter that would make a wonderful story!! Am looking forward to your next!! thanks so much Peter!! Always wonderful to hear from you! You too!! Truly stunning images (even with your old camera) and such wonderful old places. What a journey to be able to go visit..and climb that pyramid!! So much mystery I am sure… these civilisations are so very interesting. Thanks for posting this. It was a place of mystery and awe! I love your wonderful comments!! Thank you. Fantastic temples and history and amazing monochrome photos, fantastic Cybele! thanks Della! They really are amazing architectures! Seriously spell-binding. I am in awe! It’s a spell binding place. Thank you Sam!! Very suitable ambiance for those temples! I love the Palace at Sayil image! 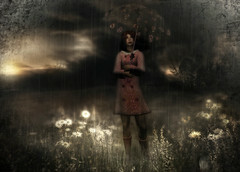 Thank you Maria, it is a moody place!! it is Joshi !! thanks for stopping by!! thanks Linda, that it is!! You certainly do not need color to be dramatic and moody – such as in your shots here. Nice work! I so appreciate your comment! The place is so moody!! Thank you Robert! Fascinating facts and wonderful photos Cybele! thank you for reading Andrea and your lovely comment!! There is so much more mystery to be unraveled with the Mayans! I do hate this destruction of writings and beautiful artifacts in the name of so-called religion. So much knowledge, truth, and history have been lost that way. Maybe we would have made it to the stars by now, if we’d had respect for other people’s beliefs and cultures, and worked in co-operation with each other rather than waging constant wars. I’m with you on that!! But it seems we never learn! A magical place from a fascinating culture. Stunning photos, Cybele! thanks so much Debbie- it is so fascinating! I’ve always wanted to visit the Yucatan! So much history, geology and wildlife. As ever, I just love the processing you’ve done 🙂 The Mayan culture is truly fascinating! You must visit one day. You won’t be disappointed! Thank you Sarah! One day if can ever afford it! There’s so much I want to see and explore over there. If I won the lottery I’d be travelling the whole world, filming and photographing all the amazing sights for myself! I dream of a life like Sir David Attenborough’s!!!! I thought you would Ed!! Thanks so much! Great images, I agree with Suzanne re your images conveying the mystery and culture of these places! It’s hard not to take a few interesting photos there!! Thanks so much Sue! That was fascinating and your photos really convey the mystery of the culture. oh you would be mesmerized by it I know!! I hope you can go some day. Thanks so much Lisa! indeed!! 😀 19 Rabbit is too productive for me! thanks so much for the lovely compliment!! The clouds and lighting in the temple photograph are stunning. yes, very dramatic!! like the place itself!! Thanks Ann!